A look at where you can download Apex Legends and on what platforms. Apex Legends is officially available starting today, though many players have had a hard time finding out where to download the game. Available on PC via Origin, PlayStation 4, and Xbox One, you’ll have to follow slightly different steps depending on where you plan to download Apex Legends. To help simplify the process, we’ve put together a quick guide on where to download Apex Legends! To download Apex Legends for PC, you can visit the game's official page on the Origin website, or find it in the Origin Store. Apex Legends is free-to-play and downloadable for PC via Origin, PlayStation 4, and Xbox One. 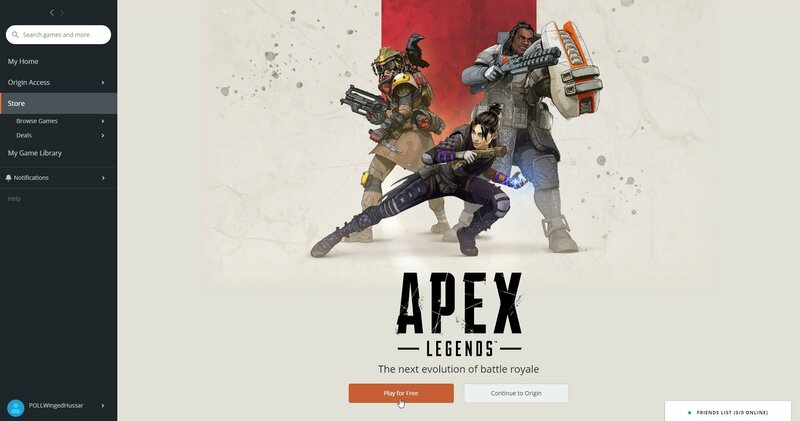 Starting with PC, gamers looking to download Apex Legends will need to head over to the game’s official page on the Origin website. From there, click on the orange “Get The Game” button to begin downloading Apex Legends. Note that you’ll also need to download the Origin client if you don’t already have it installed on your PC and create an Origin account if you don't have one. Alternatively, you can find Apex Origins on the Origin Store inside the client itself. By clicking the "Play For Free" button, you'll be able to download Apex Legends and add it to your Game Library. Apex Legends can be found on the Origin Store. To download and add it to your Game Library, click the "Play For Free" button near the bottom of the page. On PlayStation 4, you can download Apex Legends by heading to the PS Store and navigating to the Featured tab. There, you’ll find a large ad for Apex Legends. By interacting with this ad, you’ll be able to download the game. If you can’t find Apex Legends in the PS Store, you can also use the search tool and enter “Apex Legends” to find the game manually. On Xbox One, you can download Apex Legends by visiting the game’s page on the Microsoft Store. You can do this on your computer, or on your Xbox One console. Similar to PlayStation 4, once you find Apex Legends in the store, you’ll be able to download it directly. The download size for Apex Legends will vary depending on where you download the game. You can download Apex Legends via the Microsoft Store on PC or through your Xbox One. For example, on PlayStation 4 the file size is listed at 23.1GB while on PC it’s 20.52GB. Once the game has downloaded, you may need to wait a bit longer to play at max resolution until the HD texture update has finished downloading in the background. We experienced this on PlayStation 4, and while we were still able to get into a game with the HD texture update still downloading, the game wasn’t available at max resolution until the HD texture download was complete. As such, we recommend waiting the extra few minutes for the HD texture update to finish downloading. Now that you’ve downloaded Apex Legends, what do you think of the game? Do you have a favorite Legend? Let us know down in the comments below! For more on Apex Legends, be sure to check out some of our previous guides including whether Apex Legends offers cross-platform support, and our recap of the Apex Legends reveal livestream and early influencer leaks.